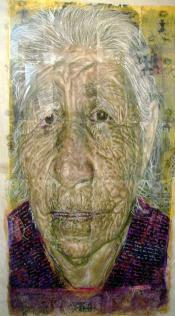 sketch not only of old age but gender, race, culture, and history. intimate knowledge is ingrained in the work, augmented by an unusual background. scribbled over, distressed and half-obscured by a semi-transparent layer of encaustic wax. a map of a life – the town where she was born and the journeys she made afterwards. still on tap, and oddly a hint of mild surprise, as if in reaction to an unusual thought. the proper subject equally of awe and terror. fads, not to mention the insanity of wars and the more subdued dementia of everyday life. that it is as if each of us was sculpted as a model of pain? find new details embedded in the surface textures, inserted literally between Litton’s lines. curse of mortality that we all share.